There’s a PPA repository contains the latest packages for all current Ubuntu releases and derivatives. Type user password (no asterisks feedback) from sudo prompt and hit Enter to add the PPA. And go to Software & Updates -> Other Software to remove PPA repositories. Full featured LaTeX editor TeXstudio 2.12.10 was released silently today. 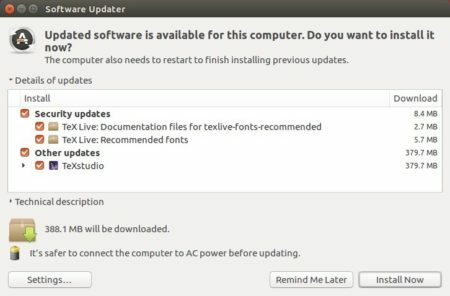 Here’s how to install it in Ubuntu 18.04, Ubuntu 17.10, Ubuntu 16.04, and/or Ubuntu 14.04. There’s a PPA repository contains the latest TeXstudio packages for all current Ubuntu releases. 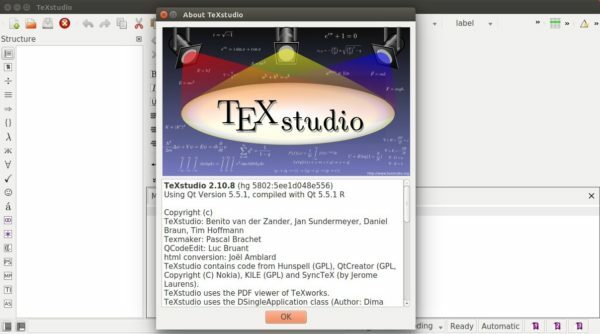 You can do following steps to add the repository and install the latest TeXstudio. And launch Software & Updates and navigate to Other Software tab to remove PPAs. 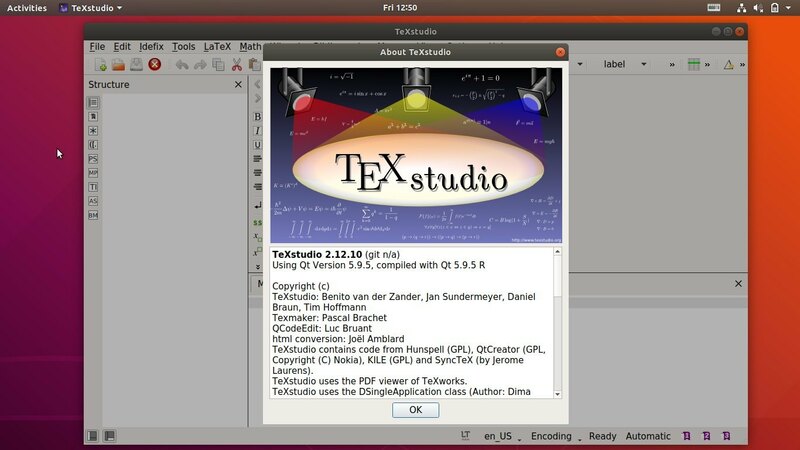 This quick tutorial is going to show you how to install the latest TeXstudio, a full featured LaTeX editor, in Ubuntu 14.04, Ubuntu 16.04, Ubuntu 17.10, Ubuntu 18.04 via PPA. The latest release so far is TeXstudio 2.12.8. It’s the first release after moved the development to Github. The developer offers a PPA repository with the latest packages for all current Ubuntu releases. 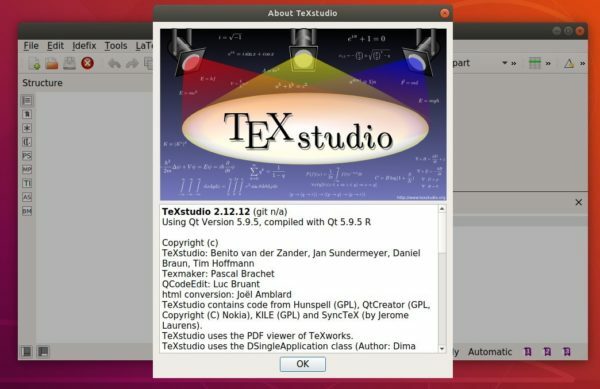 You can do following steps to add the repository and install the latest TeXstudio. 2. 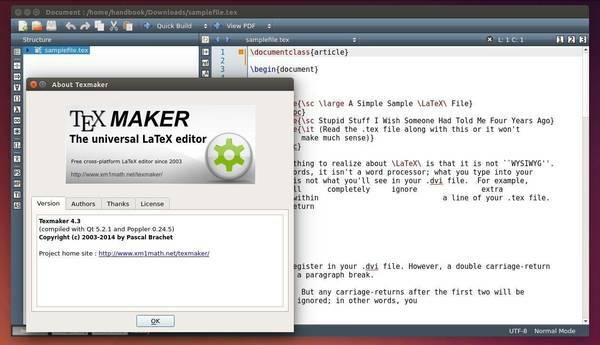 Then you can upgrade the LaTeX editor via Software Updater if an old version was installed. Texmaker, an open source LaTeX editor with an integrated PDF viewer, has finally reached v4.3 with new features and translation updates. Texmaker is entirely a Qt app that works on Windows, Linux and Macos. The editor includes full unicode support, inline spell checking, auto-completion, code folding and rectangular block selection. Regular expressions are also supported for the find-and-replace actions. if a “completion.txt” file is found in the same directory than texmaker.exe on windows, in the “/usr/share/texmaker/” folder on linux and in the “Resources” subdirectory of the .app package on macosx, all items from this file will be added automatically for the autocompletion (the syntax must be the same than for the .”Customize completion” option of the “User” menu. The official website provides .deb installer available for Ubuntu 14.04 LTS, Ubuntu 12.04 LTS, Ubuntu 13.10, Ubuntu 13.04, and Ubuntu 12.10. First check out your OS type, 32-bit (i386) or 64-bit (amd64), by going to System Settings -> Details. Finally double-click the package in file browser to open it with Ubuntu Software Center and click install.